The enTourage eDGe is a functional, easy-to-use device that currently defies formal classification. It’s primarily going to be useful to academics and people who spend a lot of time in books, but need more convenience than that offered by separate e-book reader and laptop. It has some warts, but offers surprising value in a first-generation device. Well, all that’s over now as the device has been discontinued and Entourage is sending people to the Google Book store to pick up their last purchases. 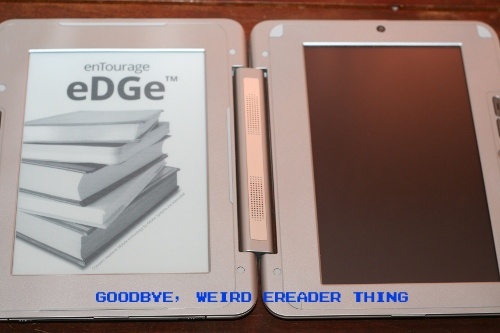 Engadget is reporting that these folks may be building a new tablet ereader but this odd chimera is, for right now, dead as disco.